Contact grilling with contact grill cooking belts is a way of mass cooking of foods using two PTFE conveyor belts. The belts are stacked one on top of the other and sandwich the product under heat and pressure as the food is conveyed through the length of the belts. A typical size of contact grill belts would be 1000mm wide x 26.5mtr long. The most common PTFE coated material used on these types of machines has a special surface. The surface is prepared by applying a thin cast PTFE film to the final layer that creates a non-porous barrier. This barrier prolongs the life of the belt by resisting ingressive fats that would otherwise easily penetrate the surface of a dip coated product. Historically the colour of these belts used to be red on one surface and brown on the other however over recent years a blue surface has become increasingly popular and is found on many end users machines. The reason for using a blue cast film is that it is easily identifiable visually if it because damaged and mixed within the food being processed. Here are a few examples of machine brands that use contact grill cooking belts. Formcook – Based in Sweden they were one of the first and early developers of this technology and way of mass volume cooking. All the above machines are very similar and use the same type of belts which Techbelt can manufacture to suit any machine type. 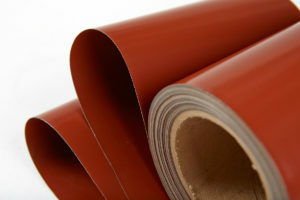 We would recommend the use of TL-12-RB material which utilises a 128 style fiberglass and premium cast film surface. Standard width are 1200m wide and 670mm wide.